Bring serenity to all those who wear the beautiful blue of Topaz, it’s no wonder this gemstone has stolen the hearts of many. Topaz comes in many colours, including clear, brown, yellow, orange, red, pink and blue. The blue topaz, with a pale to medium blue colour created by irradiation, can be found in very large sizes at affordable prices. The fine golden-yellow variety, known as Imperial Topaz, is relatively scarce. Topaz colours are rarely vivid. The most common colour is yellow with a red tint; the most valuable is pink to reddish; the most popular is blue. The colouring agents are iron and chromium. Natural blue topaz is rare, found in all major deposits and also in England (Cornwall), Northern Ireland and Scotland. Most of the blue topazes are enhanced colourless topaz gemstone. The ‘Marbella’ topaz is an exceptional 8,225-carat gemstone whose breathtaking perfection lies not only in its purity, colour and transparency but also in its expertly-crafted oval cut. The stone, whose permanent home is at the Art Natura complex, will feature in temporary exhibitions in a number of different countries, helping to raise the profile of the town after which it is named on the international stage. The topaz, whose intensely deep blue colour is reminiscent of the beauty of the Mediterranean Sea itself, will thus provide Marbella with a new ambassador. 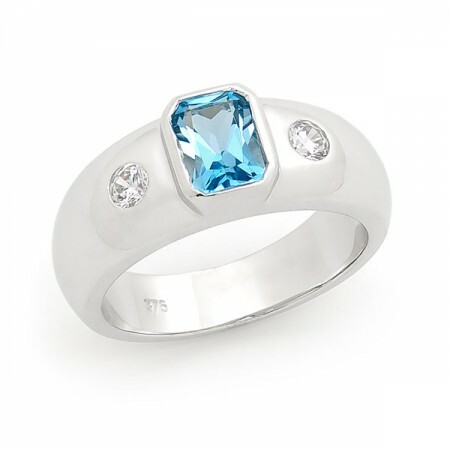 Blue Topaz is said to relax the mind of the wearer and it can make them think beyond the usual. Blue Topaz jewellery makes the wearer feel free from mood swings and boosts stability in their life. It is said that in the old times, people used to wear Blue Topaz jewellery to detect if the food and drink served to them was contaminated with poison. As people since old times have a belief that Topaz changes its colour if places in front of poisoned food or drinks. Birthstone of December born people, Blue Topaz is an excellent gemstone with great history and amazing brilliance.